Hi everyone. Welcome to the April 52 Inspirations Challenge. This month the inspiration you will use in your page designs is "TOGETHER". Maybe your page design will be inspired by things that go together, or an event or time you were together with a friend or loved one. Maybe your page design might include a song lyric about being together. The possibilities are endless. As we are dealing with a family medical situation, my life is all about my family right now, about how we take care of each other. The prompt, TOGETHER, brought memories of family time together, as in this page with my hubs and granddaughter. I can't wait to see how you all interpret this challenge! Have fun! Here's the nitty gritty about the challenge. 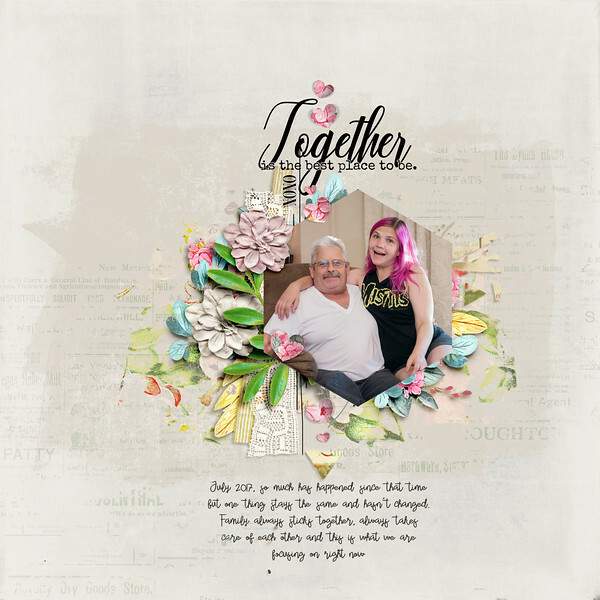 Create a layout using 100% Oscraps products, using at least some 52 Inspirations products and design your page inspired by the inspiration prompt "TOGETHER". Layouts must be completed and posted by 11:59 p.m.PST on Monday, April 30 , 2018. All participants will be entered into a draw and one participant will be chosen to receive a $7.50 coupon to the Vicki Stegall Designs store. Love this challenge and love the layouts so far!!!!! We're off to a good start this month, ladies! I love both of your layouts! perfect word art and Challenge! I love the 52 Inspiration Challenges! Here is mine.